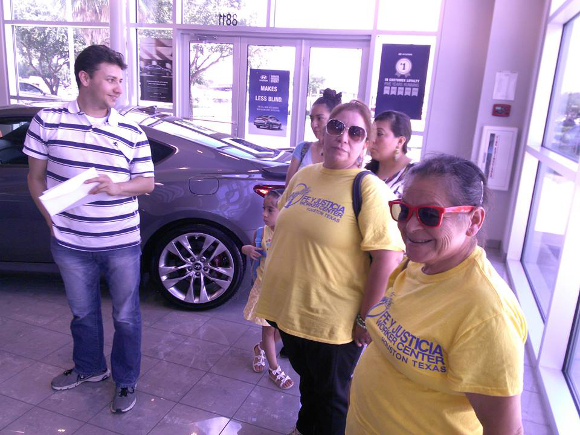 Seven representatives from the Fe Y Justicia Workers Center delivered a message in support of Lear workers to the South Loop Hyundai dealership in Houston. Workers at Lear Corporation, a Hyundai supplier in Selma, AL, have reported severe and disabling health effects from exposure to isocyanates (toluene diisocyanate (TDI)) while manufacturing car seats. Alarms that signal dangerous levels of the toxic chemical TDI in the air are frequent. Hyundai needs to take responsibility for the working conditions of companies in its supply chain. Lear ignored safety issues to the point that the OSHA stepped in on three separate occasions (e.g., here) to cite the company for breaking health and safety laws. When one of the workers at the Selma plant—Kimberly King, who suffers from asthma she developed while working with these chemicals at the plant—joined a community delegation this spring to the Hyundai plant in Montgomery AL, Lear fired her, then sued her. A federal court slapped Lear with a restraining order and preliminary injunction, but Kim’s fight to get her job back—and, above all, to make these good, safe, family-sustaining jobs —continues. Workers at the plant make around $12 per hour. 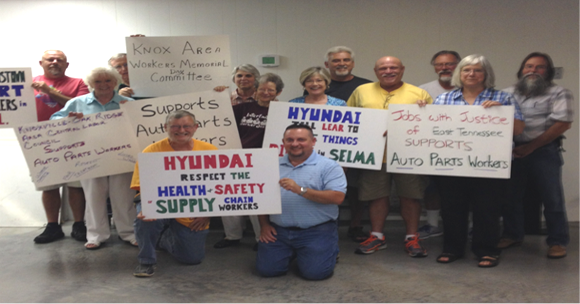 The Knox Area Workers Memorial Day Committee, Jobs with Justice, and workers from a Lear plant in Morristown, Tennessee, participated in the March on Hyundai at the Grayson Hyundai dealership in Knoxville. Hyundai has the power to step in and tell Lear to make things right. Student groups, the AFL-CIO young worker councils, and COSH groups were especially important in getting out the message that all workers deserve fair wages and safe conditions. The delegations delivered a letter from United Students Against Sweatshops reporting that the average starting wage for a job at a Hyundai supplier in the Montgomery, AL, area is just $9.07 per hour, and that three-quarters of those employers hire exclusively through temporary staffing agencies. One shocked dealership manager remarked, “Those are McDonald’s wages!” National COSH and affiliates have highlighted how dangerous TDI and other isocyanate chemicals are to workers and the need to have corporations raise the bar for better safety conditions. Workers in Selma and elsewhere are fighting to be protected from toxic chemical exposure for all workers. The public needs to know that corporations like Hyundai must step up to the plate and insist that their parts supply chains provide safe and healthy workplaces. Customers need to know that buying a Hyundai car is a vote against social justice if the company refuses to be responsible to workers. Activists from SocalCOSH, the United Auto Workers, Our Walmart, and United Students Against Sweatshops delivered a petition to the Hyundai corporate headquarters in Fountain Valley, California. Peter Dooley CSP, CIH is a safety and health project consultant for National COSH with thirty five years of experience in safety inspections, fatality investigations, worker education, and other related aspects. This article was also published at The Pump Handle.